On the way home last week after viewing the Andrew Wyeth exhibit at the Seattle Art Museum, I noticed that the low-rise portion of Rainier Square had been demolished, exposing the iconic Rainier Tower to view on all sides. I immediately made a mental note to draw that scene. 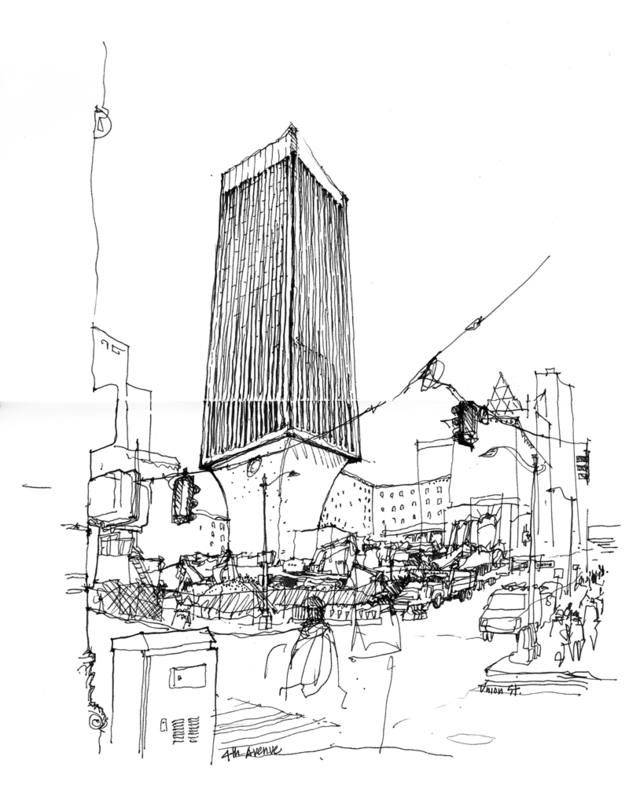 A few days later, a post by Andika Murandi on the Seattle Urban Sketchers blog reminded me to head downtown to draw Rainier Tower amid the demolition work that is making way for a new 58-story mixed-use highrise. It will be interesting to see how the old and new towers coexist on the same block. Designed by Minoru Yamasaki in association with NBBJ and the structural engineering firm of Magnusson Klemencic, Rainier Tower is unique for its 11-story high pedestal base that tapers downward, like an inverted pyramid with curving sides. When I first saw Rainier Tower after moving to Seattle in 1980, I remember wondering how the structure could resist toppling over during an earthquake. One sidenote: I drew this scene with a rollerball pen, which made me miss how sensitive the nib of a fountain pen is to the slightest applications of pressure.